Rating: Heck, 5 out of 5 stars. I loved it! His whole life, 12-year-old Callum Hunt has been taught one thing by his father: magic is bad. The Magisterium isn’t a fun and whimsical magic school, it’s a dark, terrible place deep underground where young mages are experimented upon by cruel Masters who only care about advancing their own goals. Even knowing nothing about the magical battle that left his mother dead and himself permanently disabled, Call knows his only chance to survive is to fail the test that will earn him a (mandatory) spot at the Magisterium. You can guess how well that goes for him. As an Iron Year mage at the Magisterium, Call finds that the place isn’t all that bad, he’s not actually terrible at magic, and he has friends for the first time in his life. So maybe it would be okay to stick around, except for the growing evidence that who, or what, Call is might be more dangerous than he ever imagined. The first thing you should know about The Iron Trial is that it is not, in fact, Harry Potter. It is about a young boy with a somewhat tragic back story who goes to magic school, and while there he makes two friends who become his best friends, and over everything hangs the threat of a bad guy who has started wars in the past but has been quiet for a while. To get this out of the way – Yes, okay? All of these things, and a few other nods not listed above, are very much like Harry Potter. This serves a purpose. The story line to The Iron Trial is just enough like Harry Potter to subvert it in the most intriguing way possible. I’ll admit I was a little surprised at first by how brazen the similarities were between Voldemort and Constantine Madden, the “Enemy of Death.” You can see what I mean just from the guy’s nickname. I knew there had to be some kind of angle that would play out and make this comparison significant. There is no way Cassie and Holly would basically call their Big Bad a Death Eater and expect us not to notice. 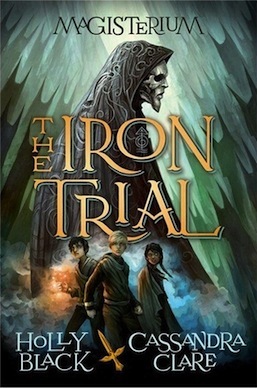 There is no question The Iron Trial is fantastic as a companion to the Harry Potter series, and to a long tradition of fantasy fiction. But this book deserves to be judged on its own merits too! The magical system Cassie and Holly have devised is frankly just really cool, pulling ideas from things I’ve seen before and creating sets of rules and powers I found delightfully unexpected. Mages learn to harness the power of the elements: Water, Earth, Fire, Air*, and the foreboding fifth element, Chaos. But go too far and you can be absorbed by the element you’re trying to control, the consequences of which range from losing your mind to losing your humanity and becoming an elemental monster. The whole going to school underground thing is pretty awesome too. I LOVED having main characters who aren’t all white/able-bodied! And diverse secondary characters too! In that respect, this middle grade fantasy novel does a better job of portraying the actual world we live in than any number of “realistic” books that I’ve read. And I also love that we’re in America (we need a good magic school around here! ), and in the year 2014. This book is very fresh and real in a lot of ways, but hangs onto the tropes of its genre just enough to feel comfortable and familiar. Until the end when that thing happens. Ahem. In general I am in love with all of the characters already, but especially our very well-rounded golden trio, Call, Tamara, and Aaron. I am looking forward to seeing this friendship grow deeper as the books go on, and also to see how it will be tested. The Magisterium series is not about to usurp Harry Potter in my heart. I truly loved reading it, but until the series continues I can’t say whether this story will become important to me or not. But while reading The Iron Trial, there may have been a couple moments where I felt like I was a kid again, getting lost in the corridors of Hogwarts with Harry, Ron, and Hermione for the first time. *Yes, I automatically put these in Avatar Cycle order. It’s different in the book. -In some ways it’s not unexpected at all -DIDN’T YOU LOVE HARRY POTTER??? Please, please, please just everybody read this book so we can talk about it!!! Came across this post by searching the tag “magic” and hoping to find a good story. Looks like I found a book to add to my reading list!